Is your salon so busy that clients are clamoring to get an appointment? Have you run out of chairs for new stylists? Maybe it’s time to open a new location. Or maybe not. Heath Smith, co-owner and director of operations for Ruiz Salon in Austin, Texas (with co-owner Allen Ruiz) has opened a few locations over the years and currently has two locations only a half a mile away from each other. Below, he shares his tips for successfully launching a new location and what he has learned from past mistakes. Before you go out and sign a new lease, you should first ask yourself a few important questions about your current business. Smith recommends gathering as much information as possible about your salon—production numbers, retail, income—every number you have. Next, he says to figure out if, within the square footage you have, you’re using all you have to produce revenue. “A lot of owners think they need to open a new location, but maybe all they need to do is take half your break room and make three new stations,” Smith says. “Sometimes you can find a new location within the space you already have by restructuring,” he adds. Many salons have a lot of wasted space, which can happen if the architect/space designer doesn’t understand the beauty industry. So when is the right time to think about another location? Smith says it’s when you get to a place where you can’t produce any more money from your current space—you’re out of stations, open the maximum amount of days and hours in a work week, and having a difficult time staffing new employees because you just don’t have the stations. Smith and Ruiz have opened a few locations over the years. One was a spa that opened in 2000 and closed in 2010 due to space limitations within the building. Another was a salon, opened with an outside partner, targeted to the middle market of clients—the ones who wanted to pay $40, not $100 for a haircut. That one was located outside the downtown area in order to access that clientele and was open from 2005 until Smith and Ruiz parted with their partner in 2011. “The only thing I have not done location-wise is move outside my own city,” Smith says. And this is where his best advice lies: Do what you know. So how do you find the perfect spot for your new location? Smith says to forget about the distance between locations and grow in the neighborhoods where there is opportunity. The newest Ruiz salon, which opened in October 2015, is only a half a mile away from the original location. But the old business happens to be on a dividing line in Austin. In urban areas like Austin, people stick to a grid of a few blocks to do all their shopping, beauty services, etc. Staffing a new location isn’t as simple as pulling a few stylists from the old location. The answer isn’t to find all new people, either. After all, you want a similar salon culture in both salons. Smith has found the best bet is to do a little of both. “The assumption is that you are replicating the culture of your original location,” he says. “But that’s impossible to do. The clients are different and the new location will probably have different hours of operation,” he adds. And depending on how you staff it, Smith says the employee mix will be the recipe to create an atmosphere that’s spliced off the original culture. The first time Smith opened a new location, he staffed it with all new people the salon trained right out of beauty school. He handed them a dream job in a dream location. And within 18 months the whole staff had turned over. In his most recent new location, he staffed with a mixture of newly trained stylists and seasoned stylists from his other location. He can learn a lot about his clients this way, too. As a departmentalized salon, he has clients who see separate cutters and colorists. In some cases, one will be at the old location and the other at the new location. With multiple locations, the logistics of managing a staff becomes trickier: Will one manager oversee multiple locations? Will you assign different managers? How will you structure successful staff meetings? At Ruiz, Smith functions as the general manager, but also has location directors. “Quarterly, we will all have meetings all together, and monthly at individual locations,” Smith says. “We made the decision to pull together as a company quarterly to build camaraderie and make employees feel part of a bigger purpose,” he adds. To maintain your brand and company culture, Smith says you have to work at it every day in all your locations. When Smith and Ruiz opened their more mid-range salon in 2005 (it closed in 2011) with a partner, they did not call it Jackson Ruiz and it had a totally different brand. “We saw this middle market of clients as an opportunity to create the H&M of hair salons—cheap chic,” he says. The market was very price-focused—the clientele wanted $40 haircuts, not $100 cuts. 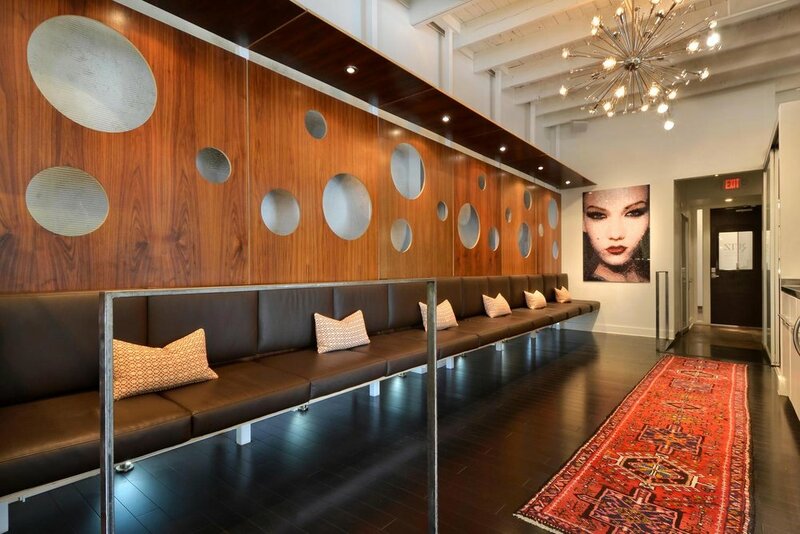 However, the clients knew Jackson Ruiz was behind the new salon and expected the kind of luxury the brand is known for. You can’t open a new salon if you don’t have the physical space. And you can’t rent a new space if you can’t get a bank loan. And sometimes, both space and loans are hard to come by—even if you already own a successful business. “The longer you do business in a market, the easier it should be to get access to financing,” Smith says. He recommends using local banks who know your business and see it thriving every day. Maybe the CEO’s wife gets her hair done at your salon. Maybe the president of the bank drives past on his way to work and sees your full parking lot. Smith says the same goes for landlords. If you’re a visible brand in your market, they will want you as a tenant. In fact, he says whenever anyone breaks ground on a new shopping center, his phone starts to ring. And with proven success, you can negotiate a more favorable lease as well. Ask for a better allowance for finishing out the space—landlords will be confident the money they spend on you won’t be wasted if you already have a business. In Austin, buying property is next to impossible for small businesses as the taxes are so crippling. But if you’re in a market where you can buy, Smith says to go for it. “Again, it’s ideal to work with a local mortgage company and bank,” he says.